I agree 100% with everything in that article. Cutting down 18000 trees is entirely unacceptable. We live in a world where the environment is slowly being damaged and torn apart because of humans. Solar panels are the future to renewable energy, but when you destroy trees and animal's habitats, it doesn't work out. I love the idea of the park to run on solar power, but unless they build it over the parking lot or anywhere without cutting down the trees, then I am against it. Given the size of the Six Flags property, there are many alternatives to come up with an alternative site on buildings and disturbed land. It is very easy to put solar panels above parking lots, which will also help shade cars and prevent clear-cutting. Solar panels can go on empty lots and on top of buildings. If it's so easy, then why don't they draw up the plans for it instead of continually claiming there are "so many alternatives?" Show us exactly where they expect 90 acres of solar panels to fit, because I'm fairly certain covering the entire parking lot and every single building still isn't enough. Check out Image A below. I'm using this tool to measure the size of the parking lots. Notice, I left the area in front of Kingda Ka empty since the park has stated in previous Solar Field articles that they use the parking lot for events. They tend to use this section a lot. (Concerts/festivals, test-drive courses, plus storing ride pieces. Bus parking. Busses will not want to fit under or navigate around solar panels. The back part of the main lot can fill up with busses certain days. Disaster Relief staging. During Hurricane Sandy, Six Flags used the Hurricane Harbor lot as a staging area for the many power company trucks, equipment, and supplies. General storage. Theme parks get large deliveries and have large equipment (cranes, cherry pickers, etc.). A lot of stuff that gets delivered sits in the employee lot. Parts for new coasters/rides generally reside in the parking lot. I'm just asking you to consider all of the above - they all will cause the actual usable area of the parking lots to be smaller than what I've outlined, but I'm going to continue anyway with the current size estimation (75 acres). Now, take a look at the Rutgers commuter lot in Image C and compare it to the panels in Image D, the solar field built by KDC Solar for Centra State Hospital. The parking lot solar panels consume only a fraction of the total parking lot area. There is a lot of open space for roadways, sidewalks, and lanes in between rows of parking spots. Another draw-back - lights need to be underneath the solar panels. Conversely, the field solar panels are densely packed together. 90 acres of open-field panels is not equivalent to 90 acres of parking lot panels. 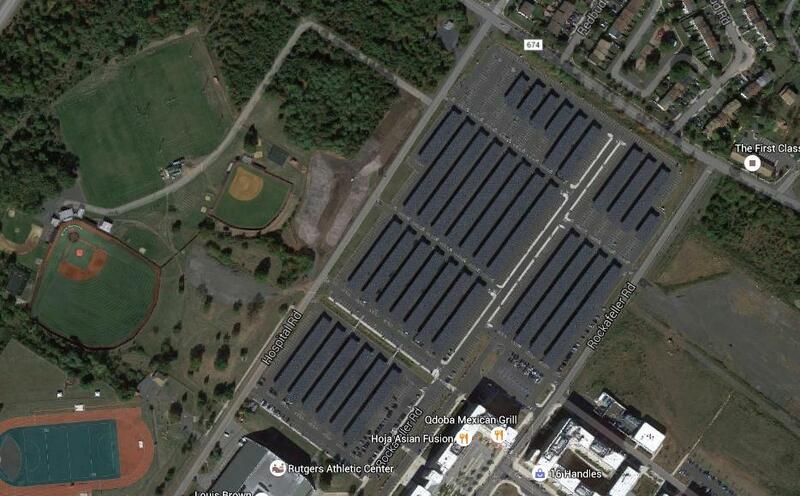 To go about estimating this, let's say parking lot panels cover 85% of the area that open-field panels do. (I feel this is over-estimating the efficiency, too) This means that our parking lots will only cover 63.75 acres of the required 90 acres. (Assuming all the highlighted lots are used, ignoring the need for busses, storage, helicopter landing, and disaster relief staging). How about solar panels on the buildings? A lot of buildings have miscellaneous items on the roof, such as pipes, vents, AC units, etc. A lot of buildings are too small to bother putting a panel on. Panel maintenance becomes tedious and costly by spreading all these panels across the park on tens of buildings. With all that said, I tried to pick out buildings that were good candidates for having solar panels. However, some buildings that I have included in the measurement do have a lot of vents, AC units, etc. that panels would need to be placed around. I'm also not sure on how well some of these buildings will actually receive sunlight. I tried to choose buildings that were not directly covered by trees or the shade of other buildings, and that are large enough to make them worth it. I gave some buildings the benefit of the doubt and definitely over-estimated the possible area for solar panels. Image E shows the building coverage. Image F lists the new total area (including parking lots) to be 81.34 acres. Remember, 75 acres of that is the parking lot, so the total building coverage is only 6.34 acres for ~34 buildings. This is almost negligible compared to what can be done in a field or parking lot. I'd say it's not even remotely worth the extreme hassle to construct and maintain panels on the buildings. In conclusion, my generous over-estimation brings us to 63.75 + 6.34 = 70.09 acres of solar panels on parking lots and buildings. This very costly solution still needs over 20 acres of solar panels somewhere. As a last note: I'm not entirely for or against the project. Sure, I'd like to see the park 100% powered by renewable energy. That'd be an amazing feat for a theme park. Everything outlined by the environmental groups sounds pretty bad, but it honestly sounds like they pull out new excuses every few weeks as to why the park shouldn't build the solar farm. I'm not sure who to trust. Is this Sierra Club basing their statements on actual scientific studies and facts of the area? It's private property, isn't it? Making this a separate post so it doesn't get confused with the above information. I've gone through and marked out a bunch of open areas. I've come up with an additional 18 acres, bringing the generously over-estimated total to 88 acres. But seriously... this is ridiculous. Sadly,I think even if the park originally proposed using the parking lots and open fields for the panels these same NJ departments/representatives would have found issues with it and would have put up some sort of hurdles. I would never go to the Park again if they put up Solar Panels over the parking Lot, or on all the buildings in the Park. They are ugly as hell, and would destroy the "illusion" of what all Theme Park's stand for. Escaping life for a day. I'm in agreement with you here in that they would normally destroy the "illusion" of what a theme park represents, however, I'm of the opinion that the park has already done a very good job of destroying any "illusion" or feeling of escaping the everyday, by itself. Also, Disneyland actually has the majority of its guest parking in a huge parking structure that really isn't ugly. Anything can be designed to look good if they're willing to spend some money, but it's clear that the park doesn't want to go that route or they would have suggested the solar panels over the parking lot from the start. Clearly, they would like the panels because of the savings they will provide long-term, but seem to care little about the environmental costs associated with removing trees from a pretty large undisturbed area of the property. That being said, what's wrong with the area that was directly inside the safari park's old entrance and exit road? Most of that area was clear of trees and isn't being used for anything (is it?). 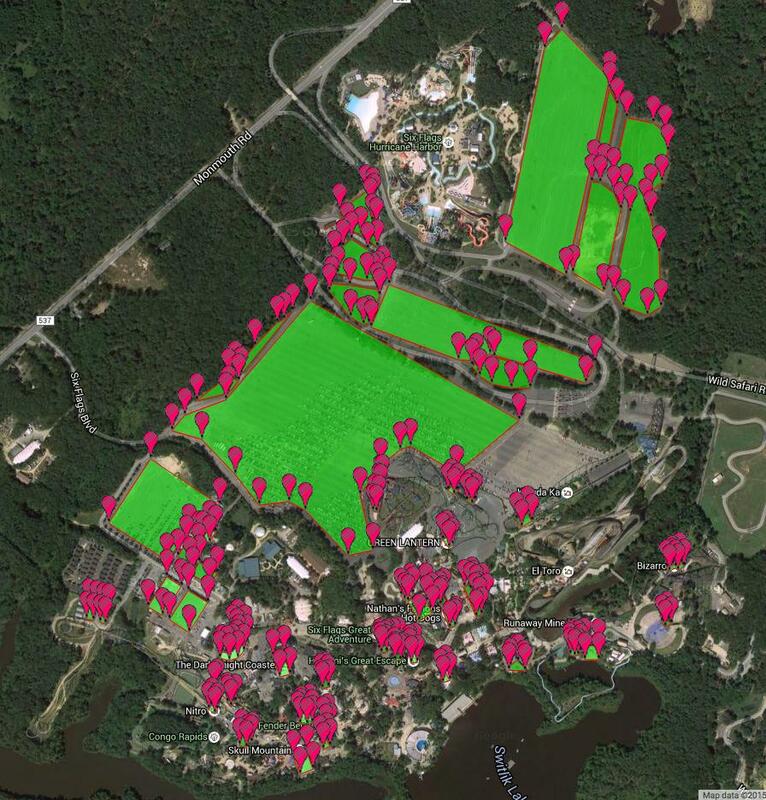 That area of the Safari is adjacent to the theme park and key for long term expansion. Putting the panels there would box themselves in and putting the panels over the parking lot was part of an initial plan from about six years ago. There were too many traffic, safety, and maintenance concerns. ^^ It will be. That area is where any major future expansion of the Park would happen. If the Hotel ever does become a reality, it will be in that area to "bridge" the two Park's. EDIT : I was posting when 29yrs posted his reply basically saying the same thing i did. And don't get me wrong, i am all for the Park going Solar. But i think they should wait a bit to let the tech for the Storage of generated Power to catch up. The way the "credit" system is set up in the State with the Utility's now, the benfits are somewhat limited. JCP&L has to follow the same rules PSEG did when i was there. If the tech for the storage of Power comes along, then they can truly "un-plug" from the Grid. The Utlity's benefit more now from Power generated from Solar, than the people that install Panel's do. My understanding was that the parking lot panels were thrown out by the new leadership for the same stupid reason Red Zone threw out Mr. Six -- simply because they were an idea from the previous team. Either way, I don't think having them over the lot would take away from the "show" in the park -- it's not like looking at a big parking lot helps with immersion at all. And Daved is definitely right that any "show" or "illusion" is pretty damn near gone by now (unless you REALLY like Takis...). Matt said it perfectly. If there are 'so many other options', just give those options to the park. Im sure they'd be more then willing to work with said options/soultions if they are legit and can be done. These damn tree huggers are out of control. And for NJ being broke, I find it funny that they can find $$$$$$ to purchase the land. Time to vote all these bums out of Trenton. Big news on the solar plan. A scaled back, 66 acre version, including Panel's in the 4.5 acre employee lot has recieved initial approval, and will go before the Jackson Twp Board very soon. Plans for a solar energy project on property owned by the Six Flags Great Adventure theme park in Jackson will see a reduction in scale when the application goes before the Jackson Planning Board next week. On Oct. 5, representatives of Maser Consulting came before the Jackson Environmental Commission to outline proposed changes to the solar energy project. The changes followed criticism from environmental groups in the wake of an initial plan for the project that was recently announced. Project engineer C. Richard Roseberry said Six Flags executives now want to construct a solar energy facility on 66 acres off Reed Road, Jackson. Six Flags owns the 130-acre tract on which the project is proposed. The property is adjacent to the Colliers Mills Wildlife Management Area. “This reduction (from a 90- acre project) is the result of conversations and meetings between KDC Solar, Six Flags and environmental groups,” Roseberry said. Six Flags representatives said KDC Solar will own, maintain and operate the solar arrays. According to Roseberry, the remainder of the 130-acre property has been designated as wetlands and will remain untouched. He said the smaller project will include the construction of solar energy panels at a 4.5-acre parking lot that is used by Six Flags employees. The parking lot solar arrays were given the green light, officials said, after the Township Council amended an ordinance that allowed for the construction of solar panels in the theme park’s parking lots. Initially, Six Flags officials announced that the solar energy project would require the deforestation of more than 90 acres at the Reed Road property. The electricity generated by the solar array would be used by the theme park, according to park executives. The planned deforestation quickly drew the ire of environmental groups. Opponents of the solar energy plan as it was initially presented said barred owls and the northern pine snake, which are protected native species, live on the property. They also said the tract in- cludes environmentally sensitive areas, the headwaters for two environmentally significant streams, and steep slopes, the alteration of which could have a negative impact on the surrounding area. To assuage some of those concerns and not run afoul of Jackson’s tree removal ordinance, landscape architect Gustave De- Blasio said the plan is to replace the trees that are cut down to make room for the solar panels by planting trees throughout the 2,200 acres that are owned by Six Flags. “We still plan to do a lot of research regarding some particular areas where the replanting will occur,” he said. Over a span of seven years, DeBlasio said, the theme park will plant 2,975 trees while monitoring the efficacy of each year’s replacement. “We talked about making an analysis of what we plant each year to see how it is adapting and what the survival rate is to supplement the replacement as we move forward,” DeBlasio said. “We are going to work with the board in order to provide the necessary vegetation to supplement the removal of the trees” from the Reed Road property. At the conclusion of the meeting, the members of the Environmental Commission unanimously voted to request the Planning Board to hold a public hearing on the Six Flags solar energy project on Oct. 19. Looks like the park is waving the white flag. If they didn't it would probably just be an ongoing battle that would never end. I don't think this sounds like they are giving in at all. It just sounds like they considered additional possibilities and this sounds like a much more reasonable approach to the whole thing. I like this much better than the original idea. Glad to see them compromise to make everyone happy, hopefully. That was the question that remained largely unanswered during the four hour long Jackson Planning Board hearing Monday night of a controversial application by Six Flags to install a 69 acre solar farm on property adjacent to Great Adventure. Despite the aggressive campaign being waged against the project online and in the media, few Jackson residents attended the meeting in dissent among an audience of approximately 80, made up mostly of out-of-town environmentalists, professionals and lawyers. In the past, highly sensitive and controversial township meetings were relocated to the nearby auditorium at Jackson Memorial High School. Plenty of open seats were to be found at Monday’s hearing. Several residents carried signs which read, “Say No to Six Flags Solar Plan”, an effort by a group calling themselves “Jackson Citizens”. While a flyer being handed out by the group warned that the solar farm will cause septic failures, pool collapses, catastrophic electrical fires and lower property values, testimony dragged on for hours as environmental experts argued over the definition of “native grass”, never coming to a general consensus despite the wealth of experience and knowledge at the table. Michele Donato, legal counsel for the environmental coalition opposing the solar farm continued her television lawyer theatrics throughout the hearing, at one point prompting planning board attorney Gregory McGuckin to issue a warning for her outburst. During the marathon debate over grass seed, Donato lashed out at the planning board when the board asked one of her environmental experts to provide seeding suggestions. “You know what my suggestion is, the parking lot,” she chirped, after her attempt to shield her expert witness from from cross-examination by the board failed. McGuckin reminded Donato that discussion was to remain on the existing application as it appears and that it was beyond the board’s authority to discuss an application that doesn’t exist. With no application before the board for a parking lot based solar farm, the board has a legal obligation to discuss matters before them and not entertain theoretical notions and wishful fantasies. In the end, if a parking lot based solar farm were to be discussed by the board, Six Flags Great Adventure would have to file an application for such a project. “You know better than that,” Mcguckin said to Donato. Planning Board Chairman John Hudak snapped at Donato’s blatant disregard for the board’s authority and asked Donato to allow her professional to answer the question asked by the board. The professional was unable to recommend a viable solution to grow grass in Jackson. At the center of the heated debate was the question, “What is native grass?” One that had no answer as environmentalists spoke circles around the planning board. In the end, “native” was a term that was entirely in the eye of the beholder. The planning board maintained that “native” grass was grass that was suited to survival in a particular ecosystem and those who drafted the ordinance sought to ensure that any grass plantings required by law would be able to take root and survive. One environmentalist claimed native was simply what grows naturally in an ecosystem. While another environmentalist claimed “native” was a strict definition of species indigenous to a particular ecosystem without any human interference. Donato, after hours of testimony on grass, rested her case on “parking lot”, being the definition of “native”. Solar panels remained a tertiary subject at the hearing behind grass seed and iron deposits below the surface. Environmentalists maintained that disturbing eco-sensitive iron deposits would cause environmental havoc and prevent certain types of grass from growing, but also conceded that there would be no harm to surrounding well water because the iron already exists in the ground. “No additional toxicity would be introduced to the water supply,” said an environmentalist speaking on behalf of Donato. The hearing will resume at the January 4th meeting. Photo: Environmentalist legal counsel Michele R. Donato argues the definition of grass seed at the Jackson Township Planning Board hearing on Monday, November 30th. This is just insanity now. If they don't want it and keep pushing for 'other ways to go about it' THEN SUPPLY SAID WAYS. They just look stupid anymore saying stuff and having nothing to back it up. If they take four hours to discuss and not even come to any conclusion about native grass then I don't see how they're going to make any viable progress or decisions in the near future. I almost don't want to believe this nonsense even with the article right there. Complaining about grass?! I care about the environment a great amount and think we need to do whatever we can do preserve it, but clearly those people don't have a real argument. The solar panels would be an excellent idea. Right now I think we should be installing as much renewable energy as possible around the country, I see no problem with this project as of now. Where on the woods will they build it? The environmentalists are continuing to drag this out forever. (Seriously, I've read through all the meeting minutes, and they just debate back and forth about grass seed for hours and hours and hours, then repeat things over and over. They bring so many "experts" to the stand just to debate around and stall). i bet people are worried about Great Adventure using up all the sun light haha but this is a real thing people believe !